Amazon is one of the world’s largest e-commerce & online retailer website located in USA and is operating since 1994. Amazon’s online retail shop helps its users to buy products from their website from any corner of the world. Payments can be made through credit or debit card and the goods will be shipped at your door step within specified number of hours / days after completing the transaction. Shipping charges do apply in case of purchases are made from any other country except USA. Users can buy variety of things from their product catalog, including eBooks, DVDs, Blue Rays, Music, Electronics, Smartphones, Tablets, Computers, Laptops, Accessories, Games, Toys, Baby Care Products, Jewelry, Cosmetics, Skin Care Products, Health Care Products, Sports Products and the list goes on. That’s how Amazon operates its huge e-commerce business. Amazon also lets its affiliates to make money from its huge online catalog. In today’s article I will be sharing the ways to make money through Amazon. We usually see people recommending good stuff to their friends or with the circle of people to whom they want to give a sincere advice about making a purchase. That’s what most of us do in our regular routine life. Afterwards your friends or colleagues to whom you had recommended any product or service, will offer you courteous words that your recommendation was awesome and the chapter closes over here. Did you ever think that your recommendation or piece of advice deserves much more than simply uttering courteous words? Yes you are thinking right, you deserve to be rewarded with cash / money for your sincere advice based upon your prior experience with that product or service. That’s how Affiliate Marketing helps to make huge sums of money just by recommending people towards any product or service. How Amazon’s Affiliate Program Makes Money for Bloggers? First you need to signup with Amazon’s Affiliate Program that help bloggers to make money by recommending products from their product catalog to others. After successful signup you can search for the product you need to recommend to your blog readers. For instance I want to recommend my readers to buy Nikon D3200 DSLR Camera, I will write the search keywords in the Amazon’s search bar and search for it, will seek the best price and deals for this particular product on Amazon’s site, then I will have four promotion options to promote this product. Link to this page, Add to Widget, Add to aStore and Share through Twitter/Facebook. The most successful and working way is to generate the HTML Affiliate Link by clicking on Link to this Page URL. Once you have clicked on Link to this page URL, it will show you following options on the web page, where you can further customize the affiliate link. 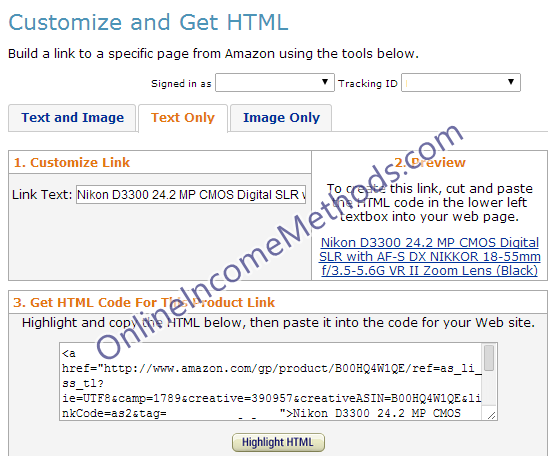 Here I have extracted the URL from HTML code which ends with your Affiliate ID. That must be present in your affiliate link in order to generate the commission. Affiliate ID acts as a tracking agent and lets Amazon know that this person has sent the referral and helps to credit your account. Either you can use the predefined Text & Image, Text Only & Image Only HTML or you can extract the affiliate URL from text only tab. Usually these big and untidy affiliate links don’t seem appropriate and are less likely to convert into sales and affiliate commission. In order to make them tidy and pretty, Blogger & WordPress users can use free Google Chrome Extension named as Link Shortener for Amazon which will not only reduce the size of URL and make it look pretty but also it will convert good in sales. 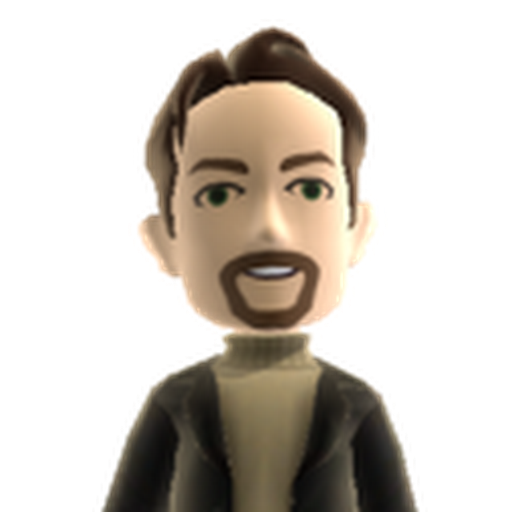 Please make sure to only use this extension, since it generates the the official short URL from amzn.com and includes ISBN number at the end. You must not forget to add your own affiliate tag in the settings of this chrome extension. Whenever you will open any amazon product page, you will be able to see this extension’s icon, clicking on that will automatically copy the affiliate link of Amazon’s product along with your affiliate tag. Now you can use this short URL in your blog posts or where ever you want to promote the product as an affiliate. Make sure to avoid any other URL shortening service except Amazon’s official link shortener, as it’s against Amazon’s terms and conditions to cloak the affiliate links, which may also end up with banned amazon associates account. So better avoid using any 3rd party URL shortening service when you already have an option to use official amazon url shortening service through the above mentioned Google Chrome Extension. If you are linking affiliate links within your blog posts, please make sure to mark affiliate hyperlinks with nofollow attributes, since you wouldn’t like to pass on your page rank juice to affiliate links and it will also help you as a safe SEO practice. Mr. A recommends Mr. B to purchase an eBook that offers tips on How to Make Money as an Amazon Associate. If Mr. B makes a purchase of that eBook from Mr. A’s link, Mr. A will earn a commission of 4.0% from the total price of that eBook. You must be thinking that 4.0% is not that good commission to be earned as an affiliate marketer. That’s somehow true, but the amazing part of Amazon’s affiliate program is that your commission level increases up to 8.50% & 10.0% based upon number of sales made through your affiliate links. Surprisingly Amazon will also credit Mr. A even if Mr. B entered through Mr. A’s affiliate link but purchased something which wasn’t recommended by Mr. A. For instance, Mr. A had recommended Mr. B to buy an eBook from Amazon through his affiliate link, but Mr. B didn’t buy the eBook, rather Mr. B purchased a Nikon D3300 DSLR Camera, even in that case Mr. A will be credited with the referral affiliate commission. Amazon names that affiliate commission as an advertising fee. 1. You must refer those products that are relevant with your blog’s niche. For instance if you are blogging for smartphones niche, you can refer smartphones, tablets, accessories as your target audience will likely convert into sales, whereas if you are promoting cosmetics products on a smartphones blog, which will not be converting well at all. 2. For making more money, try to refer products with higher price tags rather than referring products with cheap price. As a matter of fact a product whose price tag is $800 will have $32 as 4% commission while a product with price tag of $50 will generate only $2 as 4% commission. Don’t ignore the cheaper products either, you should also include cheap products of $10 – $100 mark, since cheaper products are sold at faster pace, and it will help you reach the increased commission with more number of sales. 3. As I have discussed in case II above, you will be credited for the things even if you haven’t recommended. So try to use multiple affiliate links within the blog post. Your referral link will always act as a gateway to earn extra commissions. 4. People tend to make more purchases during the holiday season or special occasions, so keep your readers updated with latest holiday season deals and keep coming with best seller lists and product reviews which tend to convert more into sales and ultimately more commissions. How much you can earn with Amazon Associates Program? Your earning capacity totally depends upon your affiliate marketing tactics & your blog’s traffic. I have seen many professional bloggers making thousands of dollars per month through Amazon Associates Program and that’s a fraction of their earning. Well established and running blogs can easily follow and implement this tutorial guide to start a new income stream, while newbie bloggers will take a bit of time to establish a passive income stream using Amazon Affiliates Program. I would recommend newbie affiliates to get started with HostGator’s Affiliate Program & Payoneer’s Affiliate Program in addition to this Amazon Associates Program so that they could increase their earning capacity as well as have more exposure to affiliate marketing tactics in the early stages that would be fruitful for them in the long run. Although I don’t claim this guide to make you rich in no time, but still you will gradually be able to make good sums of money working right from your home. Combination of patience and hard work brings success for sure!! How to Withdraw Amazon Affiliate Commission / Advertising Fee? Amazon issues commission payments to its associates every month. Basically there are three ways to withdraw your affiliate commission from Amazon. You can choose anyone of these from your affiliate account settings. Direct deposits are only available for Amazon Associates (Affiliates) based in USA. If you are from USA, you must choose this option and enter your bank details to receive your commission, if you will select Check payment method and you belong to USA, there will be a $15 check processing fee, however this $15 check processing fee is not applicable on international affiliates who do not belong to USA. Please make sure to enter correct address details if you need to opt for Check payment method where you need to have minimum of $100 earnings in your account before your Check will arrive at your address. 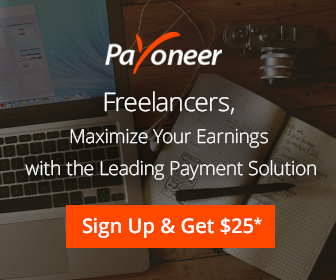 If you own a Payoneer Account and not a USA’s resident, you can still use Payoneer’s US Payment Service to Withdraw your Money from Amazon.